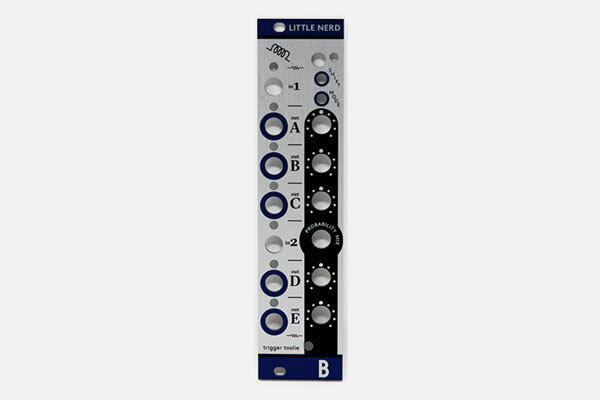 LittleNerd is trigger and clock manipulation module which tries to be able to do everything you have ever imagined and wished to do with trigger or clock signals in your modular in only 6 HP. It has 2 inputs (1,2) and 5 programmable outputs (A,B,C,D,E). Signal from input 1 can be processed into outputs on channels A,B and C. Signal input 2 can be processed into outputs D and E. Signal input 2 has probability mix knob which sets whether the signal to process by output D and E is taken from input 1 or input 2 (fully counter clockwise means it always processes signal from input 2).